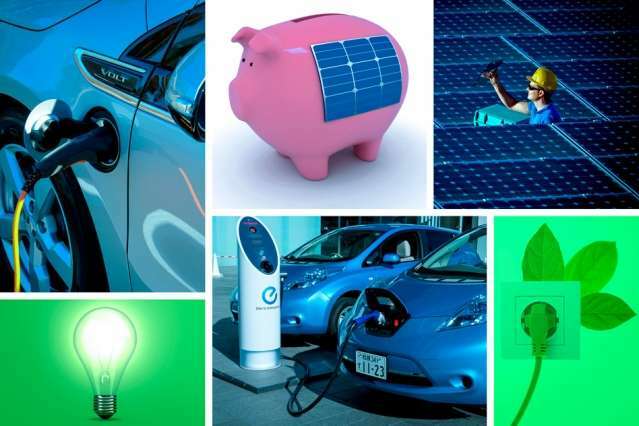 Governments often offer subsidies to consumers for clean-technology products, from home solar panels to electric vehicles. But what are the right levels of subsidy, and how should they be calculated? As a new paper co-authored by MIT researchers shows, governments can easily make subsidies too low when they ignore a basic problem: Consumer demand for these products is usually highly uncertain. Indeed, the paper's analysis suggests this has already happened in the case of the Chevy Volt, an electric car introduced in 2010 that suffered slow initial sales before gaining more traction in the marketplace. "The government will miss their target by a lot when ignoring demand uncertainty," says Georgia Perakis, the William F. Pounds Professor of Management at the MIT Sloan School of Management and a co-author of the paper. While discussion of "demand uncertainty" might sound a bit abstract, it matters. Governments usually provide subsidies based on overall adoption targets, such as the number of cars or solar panels they would like to see adopted over a period of time. But green technologies are often new products, and no one really knows how many consumers are waiting to buy them. Some models of subsidies assume a steady ratio between the dollar amount of the subsidy and the total number of cars or solar panels that will be sold. But as the new paper indicates, that's not quite the right approach. Given uncertain markets, subsidy levels don't correlate steadily with sales. Instead, it takes relatively high subsidy levels to kick-start a certain amount of business; then a more gradual increase can help achieve higher sales. For clean technologies, the research project shows, these increased subsidies should still pay for themselves even at higher levels, when issues such as reductions in pollution, which lead to lower health-care costs, are factored in. The paper, "The Impact of Demand Uncertainty on Consumer Subsidies for Green Technology Adoption," has been published online by Management Science. The co-authors are Perakis; Maxime C. Cohen PhD '15, an assistant professor at New York University; and Ruben Lobel PhD '12, an assistant professor at the University of Pennsylvania. Uncertain demand for new technologies might seem to help boost sales; firms would likely want to produce enough goods to meet potential demand, while also keeping prices low enough to spur further adoption. But that isn't the only mechanism at work. Firms always worry about having unsold inventory, and a certain number of early-adopting technology consumers seem willing to pay high prices. Those additional factors mean firms also have reason to aim for relatively high prices, while producing relatively modest quantities of the new product. That's where subsidy levels matter. Suppose the market for solar panels was predictable, with a similar number of arrays being sold every month. With a given subsidy, firms would know how much to produce and how much to charge consumers. But demand for clean-tech innovations isn't steady. For some electric vehicles and other products, sales have started off slowly before curving upward. For those cases, after studying the demand data and modeling a variety of scenarios with different subsidy levels, the researchers came to the conclusion that subsidy levels often start off too low. For the Chevy Volt, for instance, the optimal subsidy should have been higher relative to the $7,500 offered by the U.S. government, the researchers concluded. That estimation varies depending on the sales target as well as the uncertainty in terms of the sales: To get 2,000 Volts sold faster, they found, the subsidy level should have been much higher. But to reach, say, 10,000 Volts sold, the subsidy would not need to be five times as high as that needed to sell 2,000 cars; the modeling shows the needed subsidy increases in a curve that tapers off as the sales volume grows. At any level of sales, the higher subsidy helps keep firms from reacting to demand uncertainty by aiming for higher prices along with more modest sales. And higher subsidies are particularly crucial in the early stages of a clean-technology product launch. In general, as the researchers write in the paper, ignoring the uncertain nature of consumer demand when setting subsidies means "sales can be significantly below the desired adoption target level." The new paper is part of a larger program of study in which Perakis and Cohen, working with Charles Thraves, a PhD student at the MIT Operations Research Center, have studied the impact of competition in green technology markets. In particular, they investigate how the growing number of competitors in the electric vehicle industry affects the subsidy level offered to consumers. The results stem from a model the scholars have developed that uses data from the transportation and home-energy sectors while also representing many aspects of consumer choice in the green-technology marketplace. That model also allows the researchers to explore whether or not clean-technology subsidies pay for themselves in the larger context. They do, the results show, when one includes "externalities" such as costly environmental damage. "The conclusion that we drew is that basically if the government sets subsidies 'the right way,' taking externalities into account, [then consumers] will not do badly," Perakis says. "Even if there are big externalities." Other scholars say the research program and the latest paper are valuable. Ozalp Ozer, a professor of management science at the University of Texas at Dallas, who has read the paper, says it "addresses a very important and timely problem" and that "policy makers should pay close attention" to the research framework, since it "highlights some of the shortcomings of current subsidy practices." Transfer the gift of the Oil Depletion Allowance money from petroleum extraction to the technology which will replace it. That way, we all win, . . except for those who sell Filthy Fuels. They can pump their way to irrelevance.